Here we are at 38 weeks. Today we are EIGHT days away from meeting our new baby. It's such a crazy feeling! 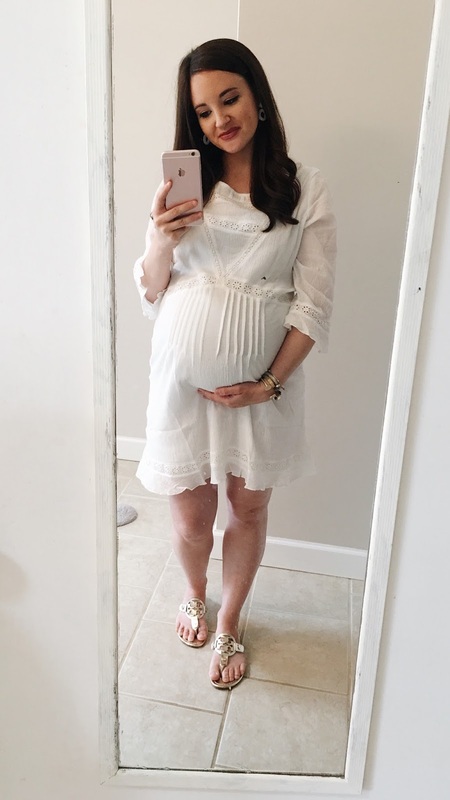 Today's post is all about what's been going on in our last few weeks of pregnancy and my last Trunk Club try on haul before baby. J. Crew Beaded Drop Earrings HERE. This pregnancy has seemed like it has lasted a lifetime. This year has been a roller coaster! With me starting work full time right before I found out I was pregnant to chasing to other babies around. After our Spring Break last week I starting staying home from work to prep (and get some much needed rest) before the baby is here. I honestly don't think I would have made it a few more weeks working! Let's face it- three and four year olds are BUSY. I've been in full on nesting mode. I've made sure to not over do it so I'm trying to do a little each day while the other two are at school. I'm still a little behind and just now packing the hospital bags today. No big deal we are just having a baby in a week! This pregnancy I've been extra tired. I've had lots of aches and pains with this one that I never had with the other two. Yesterday we went to our 38 week appointment and had a little scare. Barrett hasn't been to nay appointments with me this pregnancy because we didn't find out the gender and everything has been going great. So this was his first appointment to go to. We wanted to talk to the doctor about a few things for next week and I'm so thankful he was there. While my doctor was checking the baby's heart rate I could tell something might be a little off. He was holding the doppler on my belly a lot longer than he usually does. After a few minutes he let's us know that the baby's heart rate is higher than it should be and has been these last few weeks. He decided to hook us up to the monitor for a while to make sure everything was okay. Barrett and my doctor were both so great at keeping me calm and I'm so thankful for that! After a while we were so relieved when they told us everything looked fine and we were able to go home. My doctor did tell me that I should probably go ahead and pack my bag instead of waiting. As far as contractions I have been having them for a while but they are all irregular. So unless this baby surprises us in the next few days we will get to meet him/her next Thursday. I want to start off by saying I have been using Trunk Club for about a year now and love it. If you are not familiar with Trunk Club I'll fill you in! Trunk Club is a Nordstrom company that provides you with a stylist that selects items based on things you love. My current stylist has been been so helpful in finding things that I have been obsessed with. When you request a new trunk your stylist will pick your items and you will get a notification on your Trunk Club app that your trunk is ready to review. You can let your stylist know if there is something you aren't crazy about and they will switch it our for something else. So far this has been my favorite company that sends you clothes to try on. You have five days to try things on, keep what you love and send the rest back! I asked my stylist to send me a few things that would work during these last couple of weeks of pregnancy plus postpartum. I wanted things that wouldn't be tight fitting after I had the baby. 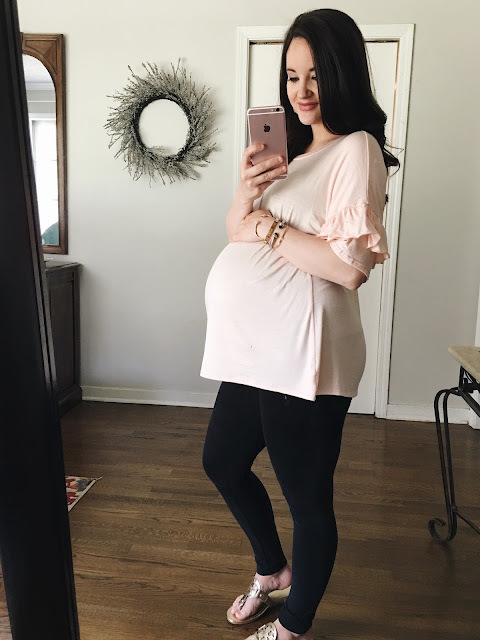 This pregnancy I have gained about 30 pounds (which is normal for me- each pregnancy I have gained 30! no more or less) So I just asked that she send me the next size up rather than my normal size small. Okay, here we go! All of these photos were taken with my iPhone and in the mirror so hopefully you can still tell how they work for me! 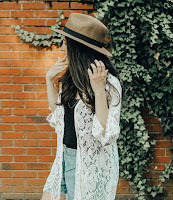 This top is so fun for Spring! It's by Free People and the material is so soft. 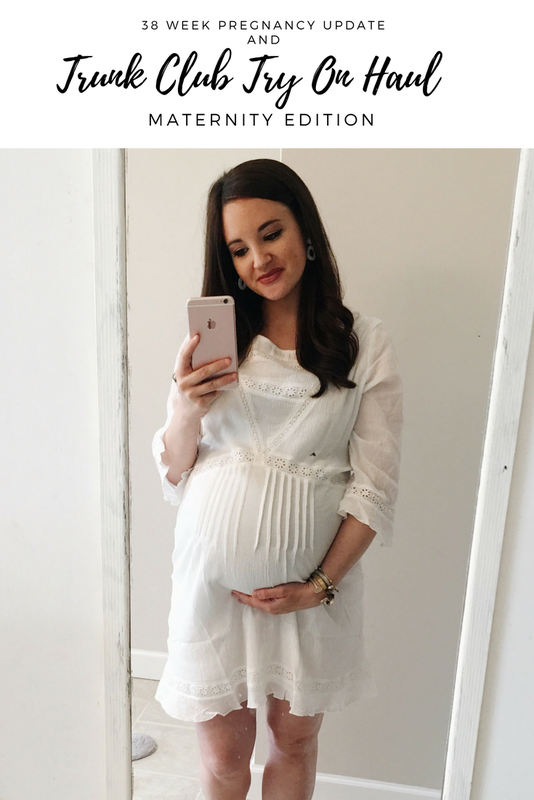 I sized up to a medium and I think it's great for the bump- Since I am a week away from delivery I decided to exchange this one for my regular size so I can wear it post pregnancy! You can find this top HERE. It comes in four other colors! Next up is this Sanctuary dress and was my favorite thing in my trunk! I sized up to a medium and it fit great over the bump and I think would be great for post pregnancy as well. I couldn't find this exact dress but this one is also by Santuary, it's white and looks almost identical. You can find it here. Next is this adorable blush pink top. The quality is so great, feels so soft, is very light weight and is a great spring to summer transition top! I sized up to a medium and it still fits over the bump and will be great for post baby. This top is super affordable and I couldn't pass it up. You can find it HERE. It comes in five other colors. 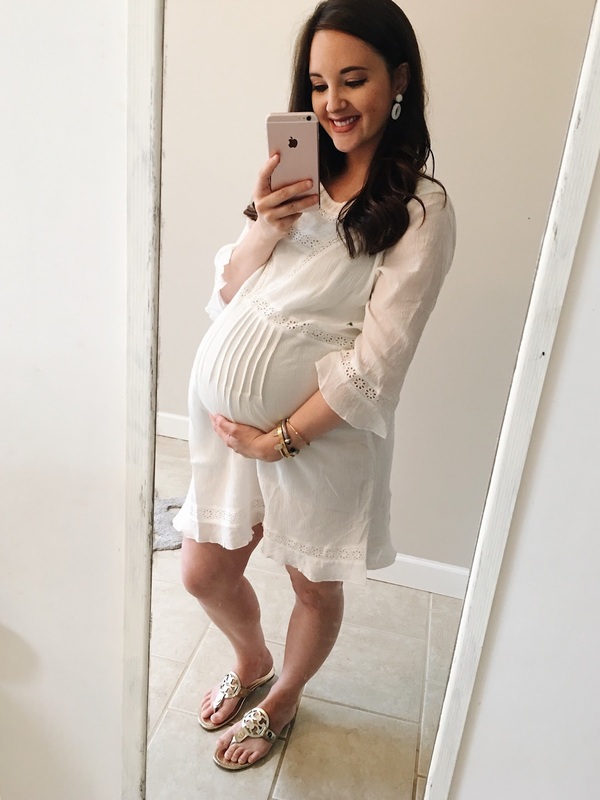 9 months pregnant but I am going to link them below! They are such cute pieces and I am planning on ordering two of these dresses after baby but sizing down. One is perfect for nursing mama's! You can find both of those my at the bottom of this post. If you are interested in trying Trunk Club you can click HERE. The styling fee is twenty five dollars but it goes towards whatever you decide to keep! Also if you have a Nordstrom card your styling fee is waived! You can shop everything on todays post and my latest trunk below! First, you look absolutely stunning - I can't believe you're having a baby in a week! Did they ever explain why baby's heart rate was higher than normal? That blush pink top is so flattering! Actually, all of these items look so adorable on you. I'm glad to hear everything is going well after the scare! I love those outfits on you. Such an exciting time. You are rocking the end of your pregnancy. Congratulations to you in your impending arrival! The high-low blouse and white dress are my favorites. And congratulations on your imminent bundle of joy!